More extreme weather, pretty late in the season for tornadoes…hopeful no one was hurt. RICE, Texas — Authorities say tornadoes have damaged several North Texas homes and a school and overturned several vehicles on an interstate highway near Dallas. Navarro County Sheriff Leslie Cotten said Sunday’s storm caused an unknown number of injuries. Cotten said officials had “a mess” on Interstate 45 near Rice, about 45 miles south of Dallas. He said the severity of the injuries wasn’t known. Cotten said the roof of the elementary school in Rice was severely damaged, and the high school football field sustained damage as well. The National Weather Service said a tornado caused “significant” damage to several homes near Lone Oak, about 80 miles northeast of Rice. JACKSON, Wyo. — A magnitude 4.6 earthquake has hit northwest Wyoming, apparently triggering a landslide on a hiking trail, but no injuries have been reported. The U.S. Geological Survey says the quake hit at about 11:45 a.m. Sunday. Bridger-Teton National Forest spokeswoman Mary Cernicek says rangers are investigating reports that a landslide covered about a quarter-mile of a trail in the national forest about 20 miles northeast of Jackson. Cernicek says some hikers may have been further up the trail, beyond the landslide, but she didn’t know how many. She says no one is believed to have been in the slide. Cernicek says the slide wouldn’t prevent any hikers from getting out. She says a forest ranger is checking to see if anyone is on the trail. Recent reports suggest that the major rupture predicted for the southern San Andreas fault could be longer and stronger than the last big quake, shaking from Monterey County down to the Salton Sea. The “Big One” that has been forecast for the San Andreas fault could end up being bigger than earthquake experts previously thought. That’s significantly stronger and longer than the southern San Andreas’ last major rupture, in 1857. Such a temblor would cause much more damage because with a larger stretch of the fault rupturing, a larger area would be exposed to the quake and the shaking would last longer. Prophecy Sign: Did you remember that Jesus said to watch for “great earthquakes”? Read Luke 21:11 and remember what you read becasue more of these huge quakes are coming. I am sending up a red flag so when they happen, I will point you back to Jesus warning. In Matthew 24:7 Jesus also said there would be “many earthquakes. Look at what has happen in the past 7 days and what happened today. 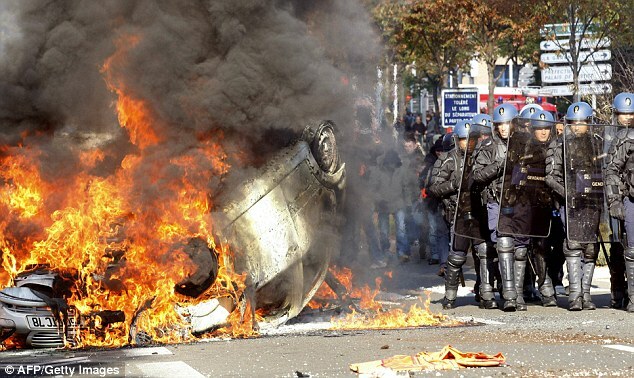 A car explodes in flames and policemen clash with rioting youths as spiralling violence grips France. This was one of many flashpoints across the country yesterday amid growing public anger against raising the retirement age to 62. In the town of Nanterre, north-west of Paris, officers also fired rubber bullets and tear gas at youths protesting outside their secondary schools. Troublemakers – not students – were accused of starting a riot, pelting firemen with rocks as dozens of vehicles were smashed and set ablaze. New Delhi – Malaria kills 205,000 people in India annually, a figure more than 13 times higher than UN estimates, research released Thursday said. The study, published in the Lancet medical journal, raised doubts about the total number of malaria deaths reported worldwide. The UN’s World Health Organization (WHO) estimated 881,000 malaria deaths per year globally, of which 91 per cent occur in Africa and about 15,000 occur in India. ‘This low estimate should be reconsidered as should the low WHO estimate of adult malaria deaths worldwide,’ the study, published online, said.